But the selectors have opted not to draft the 24-year-old straight into the provisional World Cup squad, which is unchanged from the winter series against Windies. England do not need to finalise their squad until May 22, giving Archer the chance to prove he deserves a place as captain Eoin Morgan seeks to lead his side to a maiden 50-over global title. "The selection panel has been impressed with Jofra Archer's performances in domestic and franchise cricket. He is a very talented and exciting cricketer," he said. Kya nautanki hai ,surely they will get him in the final squad. Pakistani bros will make sure that he makes it to wc. Who will he replace though? Plunkett or Wood? Ideally he should replace Tom Curran or Woakes for England. 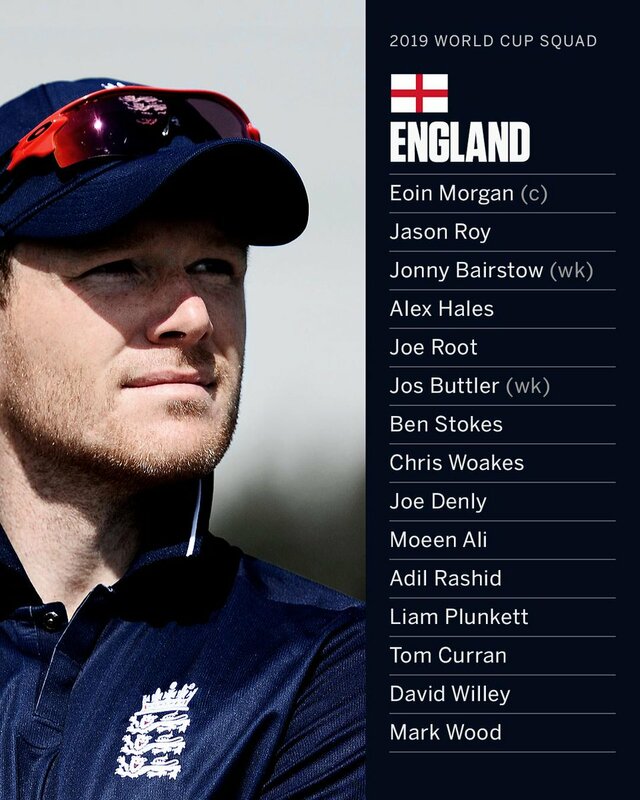 England can then play Wood, Plunkett,Stokes and Archer and that should be a good attack for even flat decks. Willey can be rotated if swing is expected . But the English prefer to lengthen their batting by sacrificing bowling strength and their selections have consistently reflected that. This is loaded batting lineup and very strong team.Bowling is not world class but which team has world class bowling. Wood has a pretty poor odi record. I dont think Woakes' place will be in question, him being the most experienced of the lot. Maybe Tom Curran will get the axe. Australia is one but their spinners are still unknown.I would not call Shami or Hardik world class.Shami is good and Hardik is barely passable.How can India call their bowling world class.SA is not world class by any means. Shami's Odi stats are seriously good. Shami's Odi stats﻿ are seriously good﻿. The problem I have with Shami is if batsmen attack him he loses the plot. He leaks lot of runs and Bumrah's economy rate is 1.25 runs lower.Bowling avg of 26 is not world class.He is good and 100 times better than overrated Bhuvi. Cummins also averages 26. Is he not world class? Shami has a better strike rate than Bumrah which is quite something considering how good Bumrah is. Cummins is not yet world class in odis, he is good but not there yet.SR and avg in odis is litte bit overated as you can get wickets in death overs when batsmen are throwing their bats.Bumrah is world class because he is almost 1.25 runs lower than any fast bowler.You can expect Bumrah to stop the bleeding when his captain brings him to attack. What about Rabada? He also averages 26. Economy slightly less than 5 but mainly plays in bowler friendly conditions. i pray that he is not picked for England team. he is a bowler as good as Bumrah, definitely better and faster than the best English bowlers. He is close but he has been better in tests.As he has shown in IPL he can be effective, 4.98 is not bad economy rate.It just shows how good Bumrah has been for India. Ok please name some world class bowlers playing right now. If Rabada and Cummins dont fit in that category then Im not sure who does. David Willey or Joe Denly should be out.. Willy is useless with ball, and what is the need of Denly, They have already so many all rounders. Bumrah, Shami, BK, Kuldeep and Chahal these make a world class bowling attack. Aus even without a great spinner is a world class attack, same with SA. bowling average of 26 is world class in this era in ODI cricket especially if you play most of your cricket on Indian pitches. i would say 30 is the new 25 and 25 is the new 20 in ODI cricket because par scores are 300 these days. Cummins in ODIs has 1.7 wickets per match, Mcgrath 1.5 wickets per match. How is Cummins not world class then? I don't think so. Bumrah and Starc are averaging in low 20s. 26 is good but not world class. Becuase wickets taken in odis need to have context of eco rate. Mcgrath eco rate makes him better even if you take inflated scoring into account. So if Starc and Bumrah averaging 22, that does not mean Cummins is not world class. Starc and Bumrah in 90s or early 2000s would have been just other worldly. As i said 25 is the new 20, 30 is the new 25.
you have to take everything into account and not just ER. You have to take general scoring rates and high wickets per match from Cummins as well. You have to also take in to account other contemporary bowlers how they performed in the same era. Like Mcgrath isnt the only one who had great ER in his era. So, it was not that rare. While in this era, not many fast bowlers averages 26 or less in ODIs. Exclude Starc and Bumrah and there are not any. Cummins, Rabada will get in low 20s once they play enough matches.Shami is not in their class.I disagree you cannot avg 26 and call yourself world class. Mesurement in every era is different. You cant judge bowlers today based on 90s criteria. As i said 25 is the new 20 because par scores have changed. Early 20 was the criteria when par score was 250-275. Now par score is 300, so criteria of bowling average also increases. Bowling averages have increased because economy rates have increased and Economy rates have increased because par scores have increased. Shami has 1.79 wickets per match which is as good as any especially for some one bowling on indian pitched. Keep context in mind and stop rotting numbers. Woakes has been our best pace bowler since the last world cup in addition to being an extremely useful all rounder. England don't need more all-rounders. They have plenty of firepower in their batting. Add archer to the likes of current Mark wood, Plunkett, stokes and the spinners and that bowling would be on par with India and SA as well. You would have all bases covered. Woakes is too injury probe and a liability . But yeah if not him ,Tom Curran should be replaced. He may have had a couple of injuries recently, but he's still been our best our best ODI pace bowler and one of the best all-rounders in the world, his place shouldn't be up for question at all right now. Personally I think Plunkett has lost it a bit recently and could be the vulnerable one. their bowling without archer will be poor will be exploited by Aus/India batting at the least. Ashwin should have been in there just to rile up buttler and rest of poms. Nonsense , great bowler will be great in any era. Your economy rate might be more but you still need to avg in low 20s to be great bowler.Shami is not a shutdown bowler, he is good but not in ATG category.